YP’s Windara Reef is at the forefront of providing new “blue economy” jobs and boosting ecotourism through marine habitat restoration. Construction of Australia’s biggest reef restoration project, south of Ardrossan in Gulf St Vincent, has now been complete. The second phase has added an additional 11,000 square metres of reef over a further 16 hectares. More than seven million juvenile Australian Flat Oysters will be laid on top of the reef base. The reef will enhance YP’s reputation as a great place for recreational fishing, boosting tourism and creating more local jobs. Read the full release here. Whilst recreational fishers can continue to enjoy the reef, a reminder that commercial fishing, anchoring, spearfishing, taking of bottom dwelling organisms (shellfish including crabs, oysters, sea urchins, seaweed, etc) are not allowed on the reef. YPC partnered with The Nature Conservancy, SA and Federal Govt, RecFishSA and UofA to build Stage I of the reef in 2017. (Photos by The Nature Conservancy). Construction of YP’s 20 hectare Windara Reef near Ardrossan is now complete. The Reef is already attracting new fish colonies and is expected to host millions of native oysters. Media courtesy of The Lead. Work on Stage 2 began in late August and was completed [in September 2018]. It involved placing almost 10,000 tonnes of limestone boulders, each about the size of a soccer ball, to form 144 reefs across the remaining 16ha area. The South Australian Department of Primary Industries and Regions (PIRSA) delivered the first 4ha of reef last year while the remainder of the project is the result of collaboration between the Australian Government, The Nature Conservancy, Yorke Peninsula Council, the University of Adelaide and the South Australian Department for Environment and Water. TNC Project Manager Anita Nedosyko said the first dives to measure the environmental benefits on water quality, fish production and biodiversity of stage one were conducted in May and June as part of a six-year study into the success of the project. 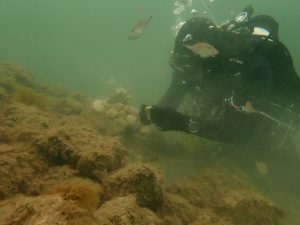 She said while the reef system was dominated by turfing algae, the adult oysters placed on the reef were surviving and a number of wild oyster spat had also found its way to the reef, which was an unexpected bonus. “You always get some opportunistic species and those will often be the first colonisers but then as that turfing algae is eaten by abalone or other shellfish then that will create space for other competing organisms,” Nedosyko said. “We’ve already seen abalone, scallops, sea urchins, schools of leatherjackets, snapper, magpie perch and a cuttlefish. The first of its kind in South Australia and the largest in Australia, Windara Reef is a shellfish restoration reef in Gulf St Vincent. Windara Reef offers great fishing for recreational fishers with fish species including King George Whiting & Snapper. The reef is named Windara Reef after the Narungga name for the eastern section of Yorke Peninsula, which is one of the 4 clans making up Narungga. It is located 1km off the Rogues Point coast, 7km south of Ardrossan and is at a water depth of 8-10 metres. The 4-hectare site is the first construction phase of Windara Reef and is made of 60 custom-made concrete structures and over 800 tones of Yorke Peninsula limestone, covered with Pacific Oyster shells & juvenile native oysters. 12 months after Stage I’s construction, a video of the reef can be viewed here. The Windara Reef was seeded with 28,000 juvenile native oysters in January 2018 which will further assist in restoring Gulf St Vincent’s marine habitat. Stage II of the reef is scheduled to commence in early July 2018 with a further 16 hectares constructed.